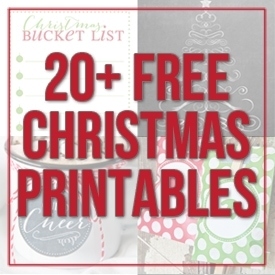 This Christmas printable is just one of many available on Yellow Bliss Road. Be sure to click the link below to see them all. “It’s the most wonderful time of the year…” Can’t you just hear Andy Williams singing those words? I remember listening to the Andy Williams Christmas album as a kid, and this song quickly became one of my favorite Christmas songs. Coincidentally, I can also hear my dad singing it in protest of the craziness of Christmas! This is one of those classic Christmas songs that just puts me in the mood and makes me want to dance around with my children in our pajamas, hot cocoa in one hand and jingle bells in the other. What a site THAT would be! 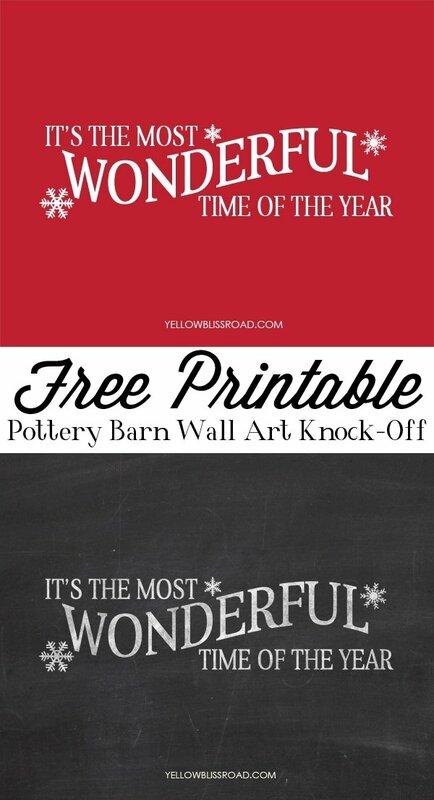 This festive printable comes in two colors, and is sized 8″ x 10″. The red is more like the Pottery Barn original, while the chalkboard adds that more rustic, handmade quality that I love. As with all of my printables, these are for PERSONAL USE ONLY, and are not for resale. Thank you kristin for all the wonderful freebies. I will definitely make good use of them. How do you use these? Do you make a stencil? How would I get this PDF file into my Silhouette Studio software for cutting? It’s made to be printed, not used with the Silhouette. Sorry! It will print out the black since white isn’t an ink color. Sorry! This is beautiful! Thank you for sharing, I have it saved and plan on using it. I followed you over from Knock Off Decor. I love this printable! It will definitely be a part of my Christmas decor!